The word legend is one that gets bandied about a bit too often for my liking, but in the case of Gordon Banks OBE, who passed away overnight at the age of 81, it hits the nail very firmly on the head. Born in Sheffield, South Yorkshire in 1937, Banks will be forever immortalised for his part in England’s World Cup winning team in 1966, but arguably the most famous image of him is one that occurred in that tournament four years later in the searing heat of Guadalajara, Mexico, when England met Brazil in a group encounter. Pele produced a powerful downward header which Banks somehow got to. In a series of saves that kept the scoreline down to 1-0 in Brazil’s favour, this one became iconic, more memorable that the match itself and it is widely regarded as the greatest save ever. After that Brazil performance, he had to miss the quarter-final clash with West Germany because of violent stomach cramps and aching limbs a day before the game; Peter Bonetti took his place in goal, and England, having been 2-0 up, ended up losing 3-2, with no shortage of blame attributed to the Chelsea keeper. For many, if Banks had played, it would have been a different story. Banks won a total of 73 international caps, amassed between 1963 and 1972. 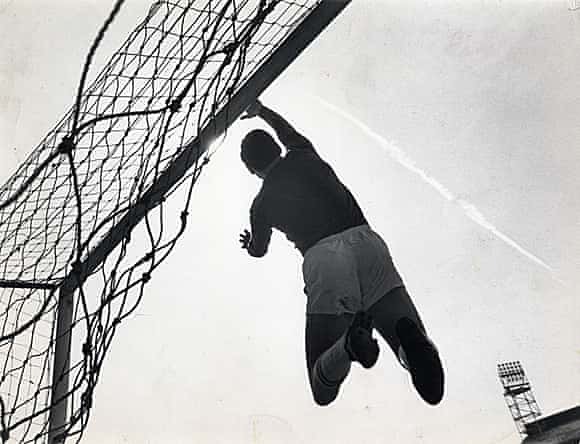 He was named FIFA goalkeeper of the year for six consecutive years (1966-71). On the domestic front, he played for Chesterfield, Leicester & Stoke, and was named Football Writers’ Association Footballer of the Year in 1972, before a car crash tragically cut short his professional career. He briefly coached Port Vale in 1977/78 before becoming manger of non-league Telford United for just 21 months, an experience that put him off managing for good. He lost a kidney to cancer in 2005 and in the last few years, the disease returned, and resulted in his passing. By any measure, he will be remembered as one of the great goalkeepers of all time, up there with Lev Yashin, Dino Zoff, Pat Jennings. But more than that he was much loved as a friend, teammate, national hero and was clearly devoted to his family. RIP Gordon. Top notch tribute- nicely written too. A Leicester City and Stoke City legend as well! General consensus appears to be that he got even better after passing age 30- as a lot of ‘keepers seem to. Almost all World Cup winning teams have had great or good goalies (the Brazilian team of 1970 was a notable exception). It’s a pity though, that Peter Bonetti received so much flak for just one genuine error in a major match. Guess that’s the way things go, but he had such a long, stellar career with Chelsea that it seems pretty bloody unfair on the whole, with the amount of rubbish he got.